Registration is now open for the 2018 Brownfields Conference for Local Government: Revitalization Tools and Techniques – Getting to Groundbreaking, coming May 10 to the Stevens Point Holiday Inn Convention Center. To learn more about the conference and to stay up to date with the latest information, please visit the RR Program’s conference and training web page. 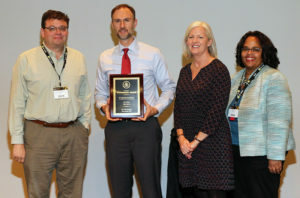 The cleanup and redevelopment of the former Mirro Aluminum factories in Manitowoc recently garnered the city an Environmental Protection Agency (EPA) brownfields award during the recent National Brownfields Conference, held December 5-7 in Pittsburgh, Pennsylvania. Receiving the EPA award is Nicolas Sparacio from the city of Manitowoc. He is flanked by Michael Prager, RR Program Land Recycling Team Leader, Margaret Guerriero and Yolanda Bouchee-Cureton, both from the EPA. The EPA recognized the city for its outstanding efforts to clean up and redevelop two former factories that the city was left with when the Mirro Aluminum Co. closed its manufacturing plants in Manitowoc in 2003. Through persistence and hard work, the city has been successful in transforming the former Mirro Plant No. 3 into loft apartments targeted towards the veteran community and artists. In addition, the city achieved a huge milestone by completing the demolition of the massive Mirro Plant No. 9 and preparing the land for development. The Wisconsin DNR’s RR Program assisted with Manitowoc’s Mirro cleanups by providing both financial and technical assistance. A summary of the Mirro apartments project can be found in the Program’s 128a Mid-Year Report for 2015-2016. To learn how RR staff can help with your community’s revitalization efforts, contact your regional Land Recycling team member and request a “Green Team” meeting. Department of Natural Resources speakers are scheduled to be part of the line-up for the Federation of Environmental Technologists (FET) 2018 Brownfields Development Seminar, scheduled for February 27, from 8:30 a.m. to 4:15 p.m., at the Country Springs hotel in Pewaukee. The day-long event will feature a number of discussions related to contaminated land remediation and the redevelopment of former brownfields, including DNR environmental considerations for new construction; legal strategies for property acquisition; a discussion regarding the real estate development process; and a discussion on the governance and policy making that makes for livable communities. The seminar is open to both members and non-members alike. Continuing education credits will be available. The National Fish and Wildlife Foundation (NFWF), along with private and public partners, is accepting applications for the 2018 Five Star and Urban Waters Restoration Program. The Five Star and Urban Waters program will award approximately $2 million in modest sized grants nationwide. Local governments and non-profit organizations can apply for this funding that can be used to assist with restoration of urban waterfront areas. All application materials must be submitted online through the National Fish and Wildlife Foundation’s Easygrants system. 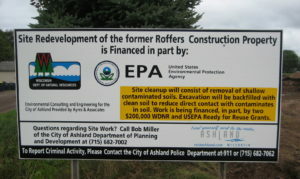 Contaminated soils from around the Roundhouse were excavated and hauled off site to the old Spooner Landfill. The Roundhouse area was then capped and seeded. This area will be used for a public space. Spooner will be renovating the Roundhouse as a public space. The city of Spooner, located in northwestern Wisconsin, pop. 2,700, has a rich railroad heritage. The city’s origin and colorful history is rooted in the railroad expansion of the late 19th and early 20th centuries. Spooner was an important railroad center of the Chicago and North Western Railway for many years. A historic railway roundhouse, a surviving turntable, and other aspects of the original rail yard still exist. The Spooner roundhouse is one of the few remaining structures of its kind. Several local and state organizations have collaborated for years on efforts to clean up environmental contamination and preserve this unique and historic landmark property. The land is in the “Museum District” which also includes the Railroad Memories Museum and the Wisconsin Canoe Heritage Museum. The Roundhouse property includes one of the only working turntables in the state. The Wisconsin Great Northern Railroad operates active tracks on the site. The regulatory issues involved in this project were handled through a collaboration of the Wisconsin DNR’s R&R and Waste and Materials Management programs. The excavated soils were placed at the old Spooner Landfill and used as part of a recapping project. 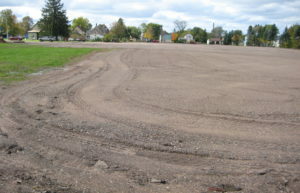 The contaminated soils remaining at the site were capped and seeded. Many years of railroad activities and subsequent manufacturing uses led to concerns about possible environmental contamination on the property. Section 128(a) funding from the EPA contributed to several successful Green Team project meetings with the Wisconsin DNR, the city of Spooner, and other stakeholders. Section 128(a) funds also supported the Wisconsin DNR’s efforts to counsel the city on managing environmental liability and other communications with the city. Spooner further received Phase I ESA contractor services through the Wisconsin DNR’s Wisconsin Assessments Money (WAM) program, funded by the EPA ARC Assessment grants, prior to its acquisition of the roundhouse property. Contaminated soils from around the roundhouse were excavated and disposed of at the old city landfill, as part of a recapping project. The roundhouse property was then capped and seeded. 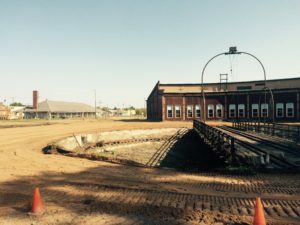 The property will be open to the public, and the city of Spooner is also renovating the roundhouse as a public space. The Roundhouse property includes one of the only working turntables in the state. The success of this northern Wisconsin cleanup site is highlighted in the recent year-end Report, a summary of the outcomes funded by a Section 128(a) grant from the US EPA made to the Wisconsin DNR’s Brownfields program. Previous 128(a) reports, including mid-year and year-end summaries going back to 2012, can be found on the DNR’s RR Program web page. 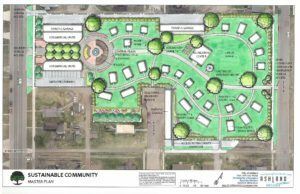 A vacant industrial lot in the heart of Ashland, just a few blocks from Lake Superior, is now poised for redevelopment with the help of two section 104(k) cleanup subgrants totaling $400,000 from Wisconsin’s revolving loan fund, known as Ready for Reuse. The success of this northern Wisconsin cleanup site is highlighted in the recent year-end Report, a summary of the outcomes funded by a Section 128(a) Grant from the US EPA made to the Wisconsin DNR’s Brownfields program. The former Roffers property was once the site of a railroad roundhouse in the late 1800s. At that time, the grounds were used for coal storage. Later, it became the site of the Ruth Manufacturing Company saw mill and lumber yard. In the 1950s, Roffers Construction operated on the site and did so until 2007. 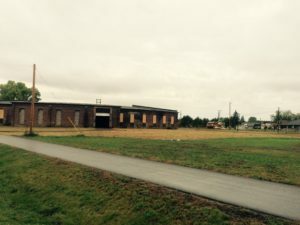 Additional buildings on the property also housed various businesses over the last century, including a flour mill, a grocery wholesaler warehouse, and the headquarters of a local general contractor. 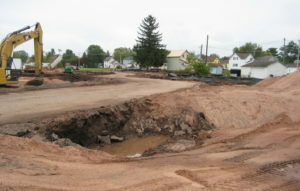 These past uses brought widespread PAH contamination that was excavated and used to mitigate a subsidence issue at a closed city landfill through a cross-program effort at the Wisconsin DNR. 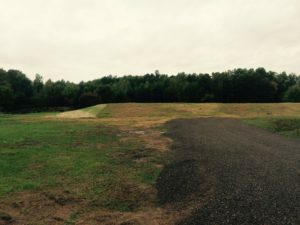 This alternate disposal location gave the city an inexpensive option for bringing the landfill back into compliance while also providing a greener remedial alternative to the substantial transportation distance and cost of hauling the material to the nearest open landfill in this rural, remote area of the state. Currently, the city is working with a promising development proposal for a mixed use, walkable residential and commercial space with integrated park and greenspace. By proposing a mix of single and multi-family dwellings with small footprints and affordable pricing adjacent to commercial incubator space, the development aims to appeal to new graduates of the local college. Previous 128(a) reports, including mid-year and year-end summaries going back to 2012, can be found on the DNR’s RR Program web page. With the “snick” of a ceremonial scissor, the new Burnham Business Center officially opens for business in West Milwaukee. This former Auto Paradise site has a long history as a carriage and cartage company, going back to the early 1900s. Most recently, the site was used to disassemble cars, stripping them of all usable pieces before recycling the remaining parts. A portion of the new, 83,000 square foot Burnham Business Center along W. Burnham Street in West Milwaukee. The facility recently opened after guidance from the DNR’s Remediation and Redevelopment program. The DNR’s Remediation and Redevelopment Program in the Southeast Region started guiding the cleanup investigation back in February of 2016. With an approved remediation plan in place, the SER team is now evaluating plans for long-term groundwater monitoring. The site is currently in the DNR’s VPLE program, a process by which an individual, business or unit of government, can voluntarily conduct an environmental investigation and cleanup of a property and then receive limits on their liability for historical contamination on that property. The new 83,000 sq. ft. light industrial facility has eight tractor-trailer bays which facilitates the cross-transfer of a variety of products. As part of the site development, work crews also conducted a stream bank improvement project, where the banks of this unnamed stream were hardened and properly re-sloped. The ribbon-cutting ceremony to open the new facility was held October 24. The U.S. Environmental Protection Agency (EPA) is now accepting Request for Proposals (RFPs) for FY18 grants related to environmental workforce development and job training. These grants are provided to eligible entities, including nonprofit organizations, to develop environmental programs that recruit, train and place unemployed and under-employed residents of communities affected by brownfields and other environmental contamination with the skills needed to secure full-time, sustainable employment in the environmental field and in assessment and cleanup work taking place in their communities. The grants, called Environmental Workforce Development and Job Training (EWDJT) grants, may be funded up to $200,000 over a three-year period. To assist applicants with their proposals, EPA will hold an informational webinar for prospective grant applicants. The webinar will be held on November 7, 2017 at 1:30 p.m. EST. It will be recorded and posted to EPA’s brownfields website. The deadline to submit an RFP is December 15, 2017. All proposals must be submitted through the grants.gov website.